Here is the sermon I preached last Sunday, both via video and transcript (after the jump). Continue reading Sermon Luke 3:7-18. 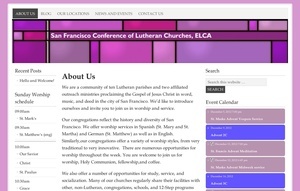 So, I'm working on the San Francisco Conference of Lutheran Churches website as my likely internship project. And it's very interesting going; as I've never worked in Wordpress before, but there are a lot of similarities with movabletype, which is what my website is designed in. Please forgive the color scheme; I did not design that. I'm sure it will be something that will be transformed into something considerably That will be a later change. At present, I've been including a calendar of events, in order to make it somewhat more useful. Most pages will also have worship times as well as direct links to conference churches' websites and/or location. One one page I have created a Google map page so people can more easily find whatever church they would like to visit. The ultimate goal for this is twofold. So that people may find a suitable Lutheran church to fit their own identity and spiritual needs, and for outreach and evangelism for those affected by negativity in other Christian churches and/or other faith origins. There is an incredible variation in churches in San Francisco; and almost everyone can find a spiritual home. I will be providing updates as this project unfolds. Sermon on Luke 21:25-36 "Signs and Wonders"
My notes are after the jump. 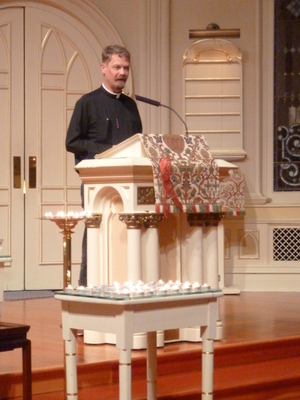 Continue reading Sermon on Luke 21:25-36 "Signs and Wonders". Here is a prayer I wrote and presented for Wednesday's Interfaith World AIDS Day Service at St. Mark's Lutheran Church in San Francisco. I kept the language as broad as I could, so it could be meaningful to people of other faiths. I also wanted to hold onto my Lutheran piety in its style and formation. The Creator be with you all. O Divine Creator, from whom justice and love are the cornerstones of the foundation of your people of faith. hank you for all the advances that we gain in the study of HIV and AIDS, its research, its prevention and the maintenance of those affected by it. Be with us as we take this walk together, and let us continue to reach out to each other seeking common ground in our similarities and finding blessing in our differences, as we are all of us your family. Give to us, your people, that guiding light that we may better and more ably walk with those who are all too often left to walk alone, give us the strength to help call others in our faith to do the same, in lovingkindness and mercy. Remind us that we are each of us but human beings who need each other. Awaken our world to the knowledge and science that we need to prolong life and give our leaders the willingness to share the science and healing with those most often hardest hit communities and nations. Above all, buttress us with encouragement and the wisdom that we can improve the quality of life for all those who are suffering, and grant us endurance in the hopes that the cure is right around the corner. We humbly ask all of this in your holy name, in whatever name we come to you, in honor and glory, forever.